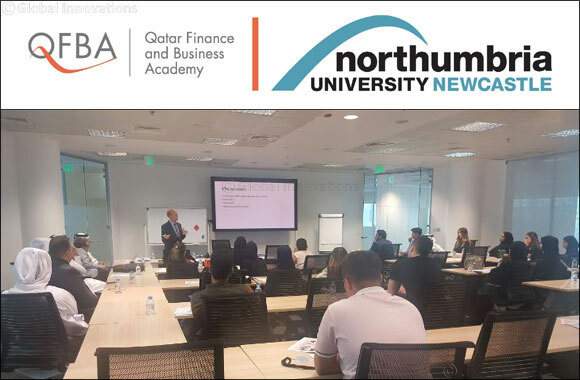 Doha, Qatar, September 10, 2018: Armed with enthusiasm and a strong vision in place, Qatar Finance and Business Academy (QFBA) in partnership with Northumbria University, started its first academic year 2018–2019 Sunday, September 9, 2018. In line with Qatar National Vision 2030 of creating a knowledge based diversified economy, QFBA is delivering full academic education and training solutions starting from the early years, and reaching to C-executive levels, promoting a career in the financial sector. The courses being offered will channelize the students’ academic mind-sets in the right direction and make them future ready to take the right business decision. Currently the courses being offered by QFBA-Northumbria University include BA (Hons) In Accounting, BA (Hons) In Finance & Investment Management and BA (Hons) In International Banking & Finance. Going ahead, Northumbria University in partnership with QFBA in plans to expand the university’s facilities, based on the market needs. QFBA’s partnership with Northumbria University opens a new gateway to a career in Accounting, Finance, and International Banking for the people in Qatar. To sharpen its focus on developing talent and delivering specialized competency development programmes, QFBA has joined forces with Northumbria University to offer its students the unique opportunity of enrolling in specialized business courses from the university. Students taking these courses will now be able to not just enjoy the benefits of a world-class education, but also the guidance and expertise of the innovative minds teaching in this programme which can lead them into a brighter professional future.